The CSI PRO-POINTER™ with HOLSTER Pinpointing Metal Detector speeds the search and recovery efforts of crime scene evidence. 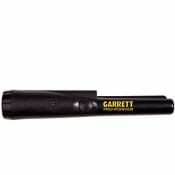 This highly–sensitive pinpointer has both audible and vibrating alarms and requires no tuning. Proportional alarms increase in intensity based on target’s proximity to quickly pinpoint weapons, shell casings, projectiles and crime scene evidence. Search walls and tight spaces for hidden items like metal pipes or studs, can also check wood for nails. Features a scraping blade to sift through soil and is also water resistant – can be washed in running water or used in the rain. Automatically adjusts – Microprocessor circuitry ensures maximum sensitivity with no tuning necessary. Pinpointing tip and 360° side scanning capability in one pinpointer. Scan with the side of the detector to quickly cover an area, then use the tip to precisely pinpoint the target. Static detection (no motion required) speeds target recovery. LED flashlight assists in low light recoveries. Woven belt holster included.